A Journal of Practical Reform Devoted to the Elevation of Humanity in this Life, and a Search for the Evidences of Life Beyond. 1/1, July 18, 1885-October 25, 1890. $1.25. Eight pp. 13 x 21. Illustrated. J.J. Owen (1827-1895) was born in upstate New York, witnessed the exploits of the the Fox Sisters, and moved to California in 1850, where he prospered. He owned and published the San Jose Mercury, the successor of W.N. Slocum's newspaper there (see the note under Common Sense) and then the San Jose Daily Times. He was famous at the time as the perpetrator of “J.J. 's Folly,” the "San Jose Electric Light Tower," a monumental tower built to illuminate the downtown from one central source. Evelyn Engel, "The Diffusion of Spiritual Knowledge in California." Online at http://userwww.sfsu.edu/~eengelSpiritCal.htm (with a picture of Owen). Though strongly in favor of women's suffrage, he was apparently not enough of a progressive and reformer for some. Macdonald, in his monumentally opinionated (but entertaining) Fifty Years of Freethought (2:479-8, now online at http://www.skepticfiles.org/think/50v1p2.htm), says of Owen and his works: "Outside these Liberals, the Spiritualist leaders in San Francisco were about as hopeless a collection of bamboozlers as could anywhere be found." He recounts at length Owen's attempt to start (either altruistically or as a fraudulent real-estate speculation) a spiritualists' community ("Summerland") in southern California. "Editor Owen of The Golden Gate, who was putting this thing over upon the hopeful, had no part or parcel with the Freethinkers and named them but to mispraise. 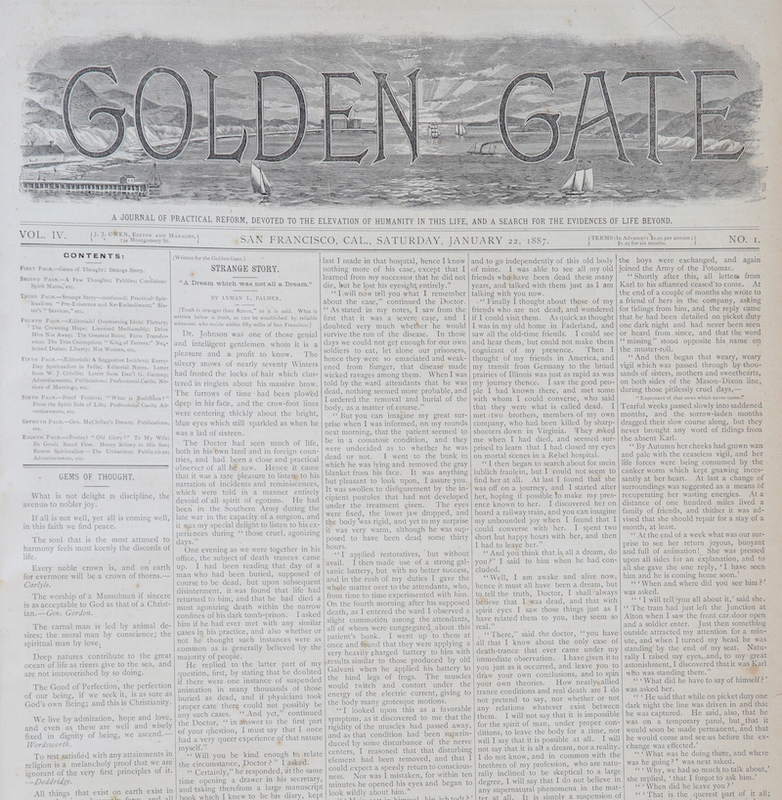 He informed his readers that his editorial articles were messages from the angels, inspirational, and obtained by 'secluding himself from the world and becoming passive and receptive to those higher and better influences and thoughts which he endeavors to express through the columns of The Golden Gate.'" On the Summerland Colony, see the note under Summerland. The story of the troubled succession to The Golden Way is told in the notes under that latter journal for April 1891. Golden Gate Spiritualist Church; Huntington Library; Yale University; San Francisco PL; California State Library; Boston Athenaeum. Volumes 1 and 4 were digitized from photographs of pristine originals held in the collection of the Golden Gate Spiritualist Church of San Francisco.